This is the first in a series of articles we will be writing about the various components of a picture frame. It may seem odd to begin with the back but the back has an important role in protecting the artwork contained in the frame. Not only that but this is where the hanging arrangements are placed without which you could not hang your picture frame on the wall! Illustrated below is a typical frame back. 2. The frame sealing tape which goes round the edge of the frame and seals the back. 3. The Artcare label - bottom left. 4. The frame bumpers - the two bottom corners of the frame. 5. The Job Label - bottom right. 6. The hanging attachments - left and right of the frame. 7 The picture hook temporarily taped to the back of the frame - top middle. 8. The artists label (if any) - bottom centre. Note that for canvas wraps or framed oil paintings on stretched canvasses there is no backing board as mentioned at 1 above. Its purpose is to provide protection (as glass does at the front of the frame) to the artwork and other materials within the frame. 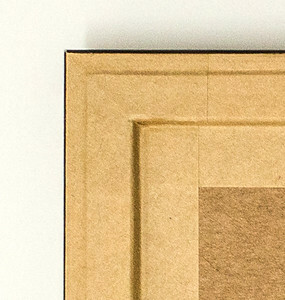 It is in essence a stiff board cut to the size needed to fit within the frame rebate and can be made from Archival quality fomecore, mdf, and other materials such as Corricore. The example above used a framing material known as Corricore. We don't use MDF because 1) it creates a fine dust in our studio which becomes an irritant (to our mood) when we have to clean up! and 2) it is not suited at all as a material for use in conservation framing. It should be mentioned here that the frame backing material will not be in contact with the artwork. This is placed all round the edge of the frame to seal the narrow gap between the back and the frame. The primary purpose of this tape is to prevent dust, insects, etc finding their way into the frame. To that end the tape must not be 'bridged'. That is, it must make contact with and adhere tightly to all the contours of the frame back. 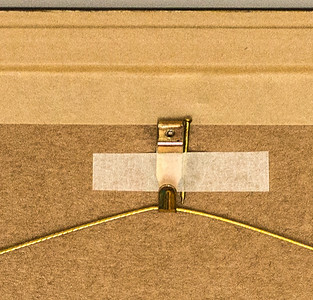 This ensures the tape cannot be easily torn and therefore the picture frame remains sealed. We do not use self adhesive tape. The adhesive on such tape will eventually fail, allowing the ingress of foreign bodies into the frame. Instead we use traditional gummed tapes. They are made wet with a brush before applying to the back of the picture frame. This is not only more secure but also gives a better looking finish. When needed we will use white archival gummed tape to seal the backs of picture frames for the highest standard of conservation framing. In such cases we use archival foam core for the back. 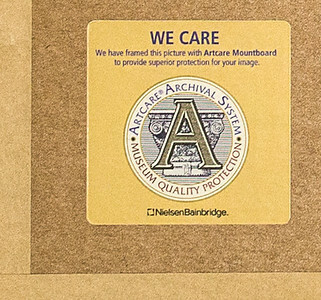 This label is applied to any picture frame for which we have made an Artcare mount. Artcare boards are made exclusively by NielsenBainbridge and we use them because independent laboratory tests prove that Artcare out-performs all other boards. Artcare protects framed artworks from the everyday pollutants that cause deterioration. In a subsequent article we will discuss Artcare mountboards in much more detail. 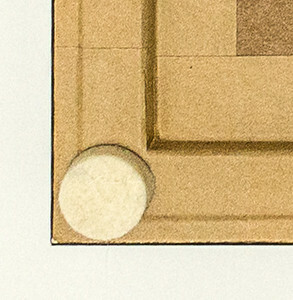 These round felt pads are applied to the two bottom corners of the frame. Firstly to help prevent any damage to the wall the picture is hanging against. Secondly to allow air to circulate behind the frame and help prevent any build-up of dampness. This label is applied to every picture frame we make. 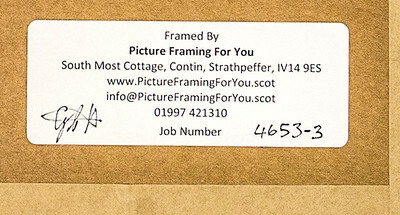 It indicates who at Picture Framing For You made the picture frame (see initials, left) and the job number (at the right) allocated to this particular job. 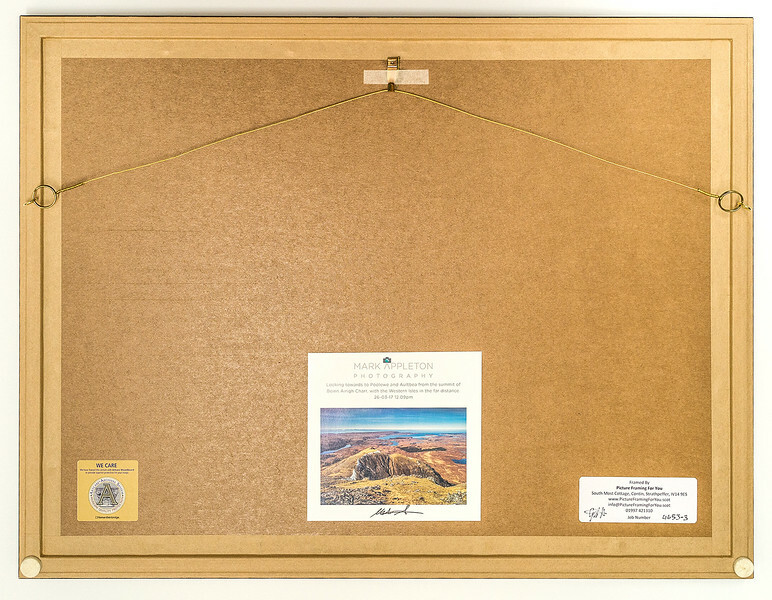 We have records of previously made picture frames which detail all the information needed to recreate them. This includes exact dimensions, specific mountboard(s) and other materials that were used as well as the moulding selected to make the frame. With this information we can frame subsequent jobs to match previous jobs you gave us - providing the same materials used are still available from our suppliers. Normally we attach a couple of screw rings to the back of a picture frame with a brass picture wire which has a rust-resistant steel core for added strength. 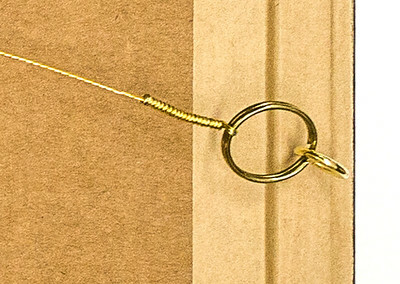 Screw rings are used instead of screw eyes because it makes it easier to hang the pictures on gallery hanging systems. We use brass picture wire of different strengths depending on the weight of the finished frame picture. If the finished picture is particularly heavy then we will use different hanging attachments, such as heavy duty strap hangers. Hooks and pins will be supplied as necessary for every picture frame we make. So there is no need to buy a hook, or to hunt around for a picture hook at home, which, as often as not, is not in the place you last remember seeing it! For larger pictures we supply a double picture hook, or two double picture hooks along with the necessary pins. Where this is supplied we will affix it to the back of the frame. Unfortunately some artists attach a self-adhesive label to the back of their artwork. This can cause problems in the future as the chemicals in the label adhesive are probably acidic and will eventually create a burn mark on the face of the artwork. We can, and have, on our customers' request, removed such labels and put them on the back of the frame. However we will not do this if we feel that removing the label may result in damage to the artwork!